November began on a chilly note, with rain turning to sleet during the morning census. Overnight winds from the north brought in hundreds of Red-Breasted Mergansers and several Common Loons, as well as the season’s first Snow Buntings. That evening, PIBO held its third public owling night, and despite strong winds managed to capture an Eastern Screech Owl – the same bird, in fact, that was banded during PIBO’s first public owling night this year! More Snow Buntings were seen on census November 2nd, and several Golden-Crowned Kinglets and Ruby-Crowned Kinglets were captured. 28 birds were banded altogether, a high total for the end of the fall season. From there, activity in the netting area continued to slow down until the last day of banding on November 8th. Interestingly, a Nashville Warbler was banded on November 5th, and two Orange-Crowned Warblers were seen on census on November 7th. These sightings were rather unusual, as most warblers except Myrtle Warblers had finished their migration by the beginning of the month. More bird activity was seen on census, as large groups of Scaup species, Red-Breasted Mergansers, Buffleheads and Red-Necked Grebes were frequently seen out on the lake. Common Loons and Common Goldeneyes were seen occasionally as well, and the first Black Scoter was seen on November 6th. Sparrows were occasionally seen in the vegetation along the west beach, including American Tree Sparrows, Song Sparrows, Fox Sparrows and Vesper Sparrows. On November 13th, a number of Rusty Blackbirds was seen flipping over dead leaves as they foraged for food on the beach, and another Orange-Crowned Warbler was seen on November 14th, along with a couple of Hermit Thrushes. A flock of Tundra Swans was observed flying overhead on November 14th, a common and distinctive sight around Pelee Island at this time of the year. Tundra Swans are so named because they breed on the tundra of the Canadian Arctic. Individuals seen migrating south through Ontario in the fall are on their way to their wintering range on the Atlantic coast, in Chesapeake Bay, Maryland, and North Carolina. Their migration can be up to 6 000 km long and is undertaken in stages, with the swans stopping to rest and feed in fields and wetlands along the way. They are the most common swan found in Canada. The fall season ended on November 15th, when thousands of European Starlings were seen flocking together, and many groups of Horned Larks and American Pipits were seen flying over the tip. Overall, PIBO enjoyed a wonderful (and unusually warm!) fall. 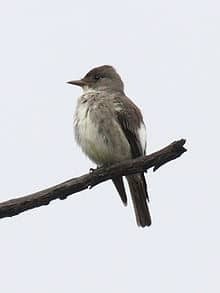 1652 birds were banded of 57 species, including the stations first Olive-Sided Flycatcher. An overview of the 2014 fall season will be available on PIBO’s website (www.pibo.ca) and in the fall edition of the Auspice later this year. We at PIBO would like to thank all our followers for their ongoing help and support. Migration monitoring will resume in April 2015. See you then!